Scout Troops and individual Scouts as young as five who are accompanied by an adult, are invited to participate in this volunteer opportunity at our Concord or Fairfield warehouse. Participants will bag fresh produce for the Community Produce Program. Check back in December 2019 for upcoming dates! 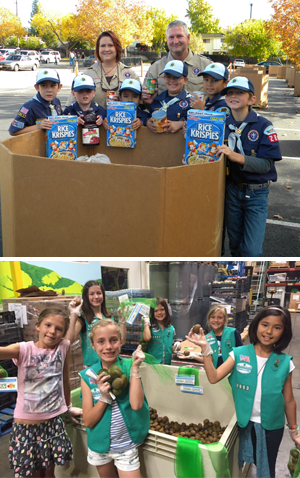 Girl Scout Troops and individual Girl Scouts as young as five who are accompanied by an adult, are invited to participate in this volunteer opportunity at our Concord or Fairfield warehouse. Girls and adults will bag fresh produce for the Community Produce Program. Check back in September 2019 for upcoming dates!